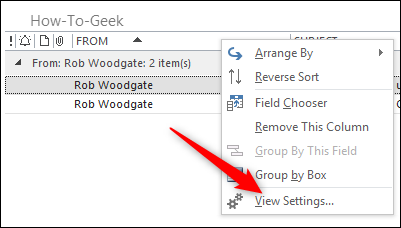 Outlook lets you create and customize folder views in many ways, like adding and removing columns; grouping and sorting messages; and even applying conditional formatting. 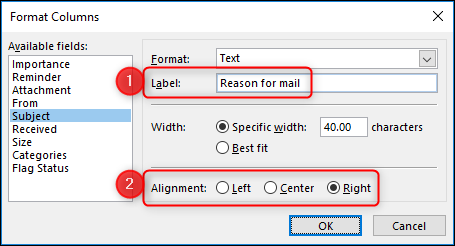 You can also customize how Outlook displays information in specific columns with the format columns option. Let’s take a look at it. To start, we’ll open up the Advanced View Settings window. Switch to the “View” tab on the Ribbon and click the “View Settings” button. You can also get there by right-clicking a column header and selecting the “View Settings” command from the context menu. The Advanced View Settings window lets you customize the folder view. Click the “Format Columns” button. 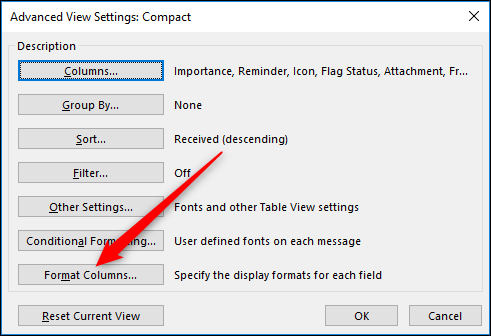 The Format Columns window displays all of the columns that you can edit in the currently-selected view. The columns shown here are all of the ones in the default “compact” folder view. 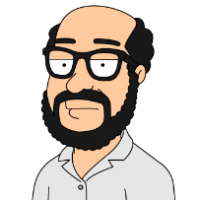 The Mention column is missing because that one has specific formatting you can’t change. But that’s uncommon; you can format most columns here. RELATED: What’s the Mention Column for in Microsoft Outlook? The type of formatting you can do is determined by the column. 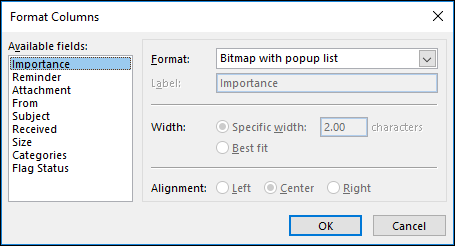 The Importance column only lets you choose between using a bitmap (an image file that shows an up or down arrow for High and Low importance respectively) and text (the written name of the importance: High, Normal, Low). 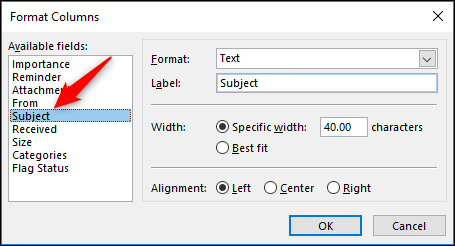 The Subject column, on the other hand, lets you edit all of the options (although the only option for Format is “Text,” so not much to change there). After clicking “OK” a couple of times to exit out of those windows, we can see the column changes immediately in our folder. One of the more useful change is to the “Received” column. 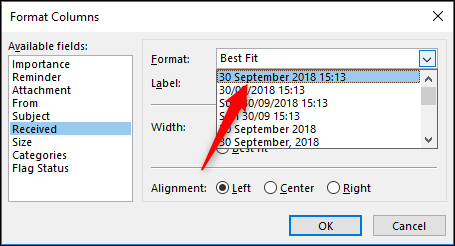 By default, it shows when the received date for messages in a rather unwieldy combination of “day” + “date” + “time,” which isn’t very viewer friendly. With column formatting, you can change this. Go to View Settings > Advanced View Settings > Format Columns and select the “Received” field. The default Format is “Best Fit,” but if you hit the drop-down menu, you’ll see a lot of other options. We’re going to change to the top option to remove the “day” part of the format. When “OK” out of the open windows, the column has changed, and it’s much easier to read. You can choose whatever format works best for you, so if you’re the kind of person who keeps their messages under control, you might want to do without the year. If you’ve really got control of your mail, you can just show the time the message arrived, but we’re not ready to do without the day and month yet. 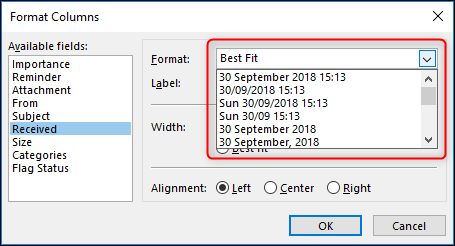 You can change any column that appears in the Format Columns panel, and if you apply the folder view to any other folder, the changes to column formatting you’ve made also transfer over.